I’ve been dipping my toes into Doom mapping again recently. Obviously I’ve done it successfully once before, but I’m having trouble doing it a second time. I have three major problems: drawing everything too small, drawing everything too rectangular, and completely blanking on what to do next. Those last two are a bit tricky, but struggling with scale? That sounds like a problem I can easily solve with charts and diagrams and math. March’s theme is video games, sort of? It’s started heating up here, and we’re in the middle of our usual ritual of trying to avoid turning the AC on for as long as possible. The house has been a bit of a sauna, which is somewhat distracting. Also a bunch of terrible crazy things happened on Twitter. Oof. 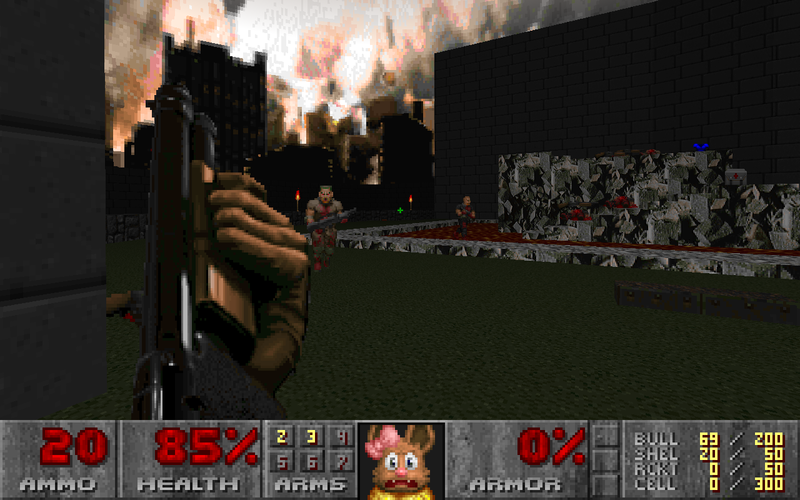 doom: I playtested other people’s maps from that ZDoom mapping project. There are a lot of maps, and I’m just about half done, and wow it takes a very long time to play through this much Doom. I hope some of my commentary is helpful to the other authors! SLADE: I chased down a bizarre obscure bug and eventually concluded it was a problem in wxwidgets. art: Lots of doodlin’. I animated something for the first time, for Mel’s birthday, and then drew myself a new avatar! I’m pretty happy with both of these, wow. blog: Added some more suggestions to my Twitter post. Dabbled, briefly, in figuring out how to make Pelican host work I’ve done, like that Doom map. I’ve got a few Patreon things to finish in the next few days, and along the way I’d very much like to work out a scheme for hosting other work on this domain.